A Passion for shirts that goes back over a century and continues today with all the magic of an immutable legend. Truzzi, the shirt maker was founded in 1890 by Luigia Truzzi, in a period when sophistication was the reserve of a noble elite. 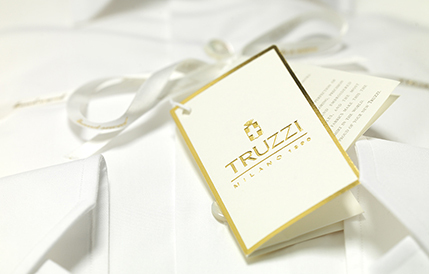 Truzzi has been satisfying its customers’ uncompromising demands for quality and elegance ever since. This elitist spirit survived even after 1948 when the business was taken over by Tina and Ferruccio Ballini and the same spirit lives on today in the original atelier in via Santa Eufemia. Superior tailoring, refined style and tradition based on authentic values such as the simple yet invaluable ingredients that brought success to Truzzi. 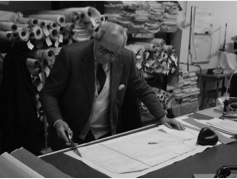 An international success too, which in the course of a century earned the favour of such illustrious figure as Vittorio Emanuele II of Savoy, Herbert Von Karajan, Leopold Strokowsky, Eugenio Montale, Vittorio De Sica and Gary Cooper, who all went to Truzzi for their made to measure shirts. A Truzzi shirts survives the test of time. 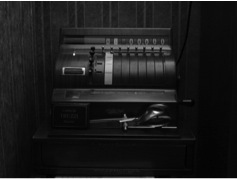 It’s a classic product which, as such, rises above ephemeral fashion in every epoque. Luigi Ballini inherited an extraordinary sense of elegance from his father Ferruccio. His tailoring skills have earned him well deserved success and the esteem of those devoted to elegance. 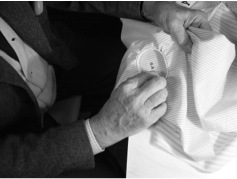 In the Truzzi atelier, Luigi Ballini practises and teaches the art of sewing, to make splendid shirts all crafted to perfection by hand. After it was acquired by Saitt, Truzzi upgraded its customer service and widened its scope. Today, in fact, Truzzi also means seasonal collections and bespoke services in all the boutiques distributing the brand world-wide . Yet nothing has changed. As always, the best fabrics are selected, the finest cottons, the softest linens and the most precious silks. In the best Truzzi tradition, the wearability of of the end product is the fruit of a long process of developing the models used for cutting, of a handcraft tradition and a passion that have been handed down through four generations. Elegance is never ostentatious, it is a crowing refinement of a great many small, precious details. In Latin elegans denoted someone who was able to eligere , to choose. So according to tradition, being elegant meant being able to choose, to recognise all the tiny details from a taste for fine dressing. Elegance demands knowledge. This is why the sophisticated details of Truzzi shirts don’t merely represent an eccentric habit but are expression of knowledge, a rich heritage of sartorial know-how that has always been at the service of elegance. Collars are fused or non-fused. Non fused collars are made of pieces of cloth sewn together to form a core. The whole process is by hand. More modern fused collars have the same refined look as the non-fused collars but add a touch of practicality too. The collar has removable stiffeners. The gussets where the stiffener is inserted is made in such a way that it doesn’t make the tip of the collar over-heavy. The slit on the back of the collar makes it lighter around the fold and thus easier to turn. An elegant and sophisticated detail that also serves to distinguish non-fused from fused collar shirts.The Truzzi collection has over 20 different collar models. The shoulders, sleeve seams, neck seam and cuff seams are all hand stitched. The sleeve is attached to the body with a wide double fell seam: the same stitching but narrower is applied down the sides. This handcraft technique produces extremely strong and refined looking seams. The “botta”, on the other hand, is a special stitching for the sleeves, which are never perpendicular to the body but slightly oblique. This technique prevents unsightly creasing around the armpits and improves the shirt’s wearability. The sides have flat-fell seams. The sleeves are only applied when the entire side has been sewn. This procedure is similar to that used in tailoring jackets and makes for perfect wearability. The mouche is hand sewn on the sides to join the base of the stitching in the hem at the bottom of the shirts. ← S&T Venice Campaign out at London Underground Stations!